Camping season is in full swing! Weekends in the outdoors are a favorite family activity but do take a bit of planning. Kilyn's Kitchen is here to help, with our Campsite Hero series of camping tips and tricks. We saved the best for last! How many times have you tried to whip up a gourmet meal by campfire? Well, we've got you covered! Our meals are filling, simple and delicious - perfect for camping! No mess. No prep work. Just pop the meal in a pot of boiling water and dinner is served. We hope you enjoyed our tips posted every day this week! Click back to view tips 1 through 5. Camping season is in full swing! Weekends in the outdoors are a favorite family activity but do take a bit of planning. 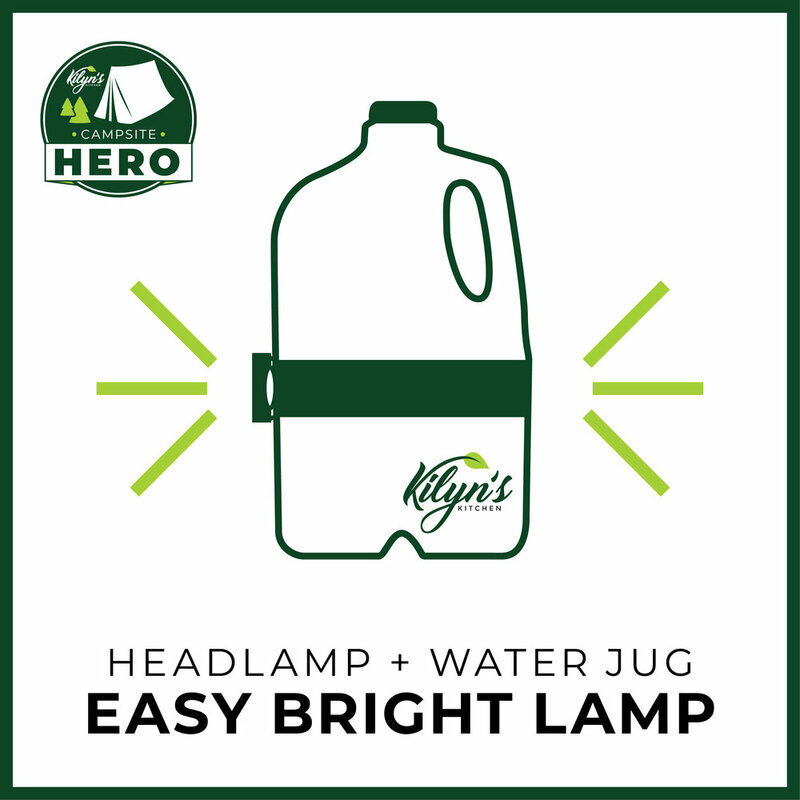 Kilyn's Kitchen is here to help, with our Campsite Hero series of camping tips & tricks. As bedtime approaches, fill your Nalgene with hot water and slip it into your sleeping bag. Your toes will thank you. Stay tuned to our blog every day this week for a new tip, and remember Kilyn's Kitchen Family Meals are the perfect dinner solution for an easy, filling meal around the campfire. No mess. No prep work. Just pop the meal in a pot of boiling water and dinner is served. Your headlamp can pull double duty as a lantern! Simply turn the light to face inward on any water jug and enjoy the ambient glow. These make great inexpensive night lights for the kiddos, or night time path lights. Ditch the lighter fluid and start your campfire by putting a briquette of charcoal in the "egg beds" of an empty egg carton, build a "tee pee" of firewood over the carton, light the carton and stand back to embrace your inner cave(wo)man power. Put a pot of water over the fire, toss in a Kilyn's Kitchen meal and dinner is ready in 25 minutes. 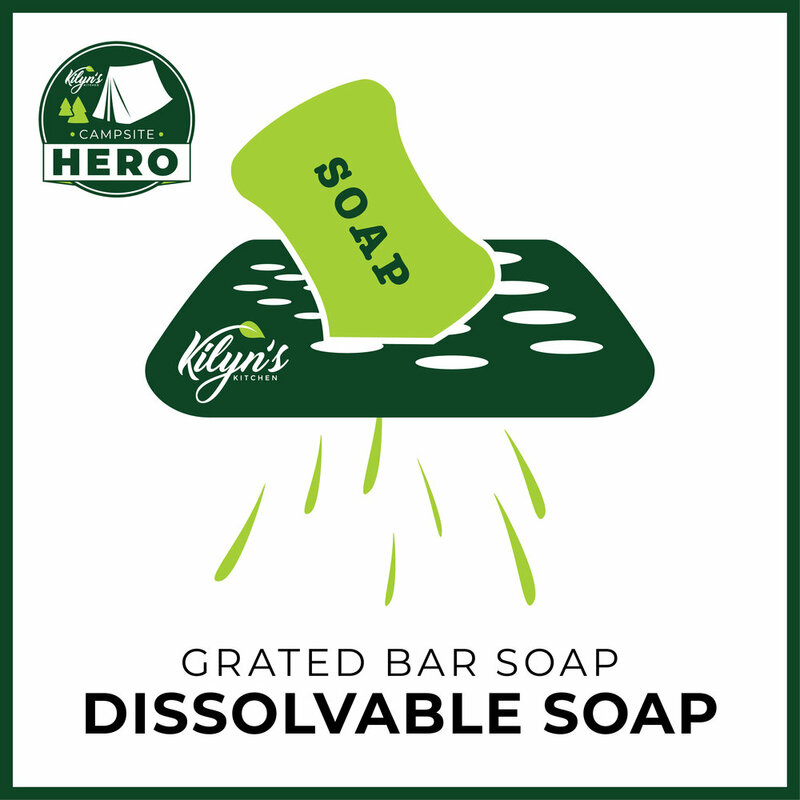 Instead of taking one bar of soap for each family member, go green and use a potato slicer or grater to turn one bar into many soap shavings, perfect for quick hand-washing and single-use camper cleanup. Instead of tents full of dirt, grab your car floor mat and use it as a place to wipe your feet before entering your weekend abode. No need to pack an extra mat or to use a towel that will inevitably blow away. Your sturdy car floor mat is an easy solution to an uncomfortable, sandy sleeping bag. #MomJokes for International Joke Day! It's International Joke Day! Try some of these #momjokes on your kiddos today, cause if you can't embarrass your kids, what's the point? A: A mouse because it squeaks. Q: Why is it so windy inside a sports arena? Q: How does a train eat? A: It goes chew chew. Q: What did the ocean say when it saw the storm coming? Q: What kind of witch likes the beach? A: When he catches a fly. We are not accepting applications at this time. Please contacts us if you have any questions. Thank you! Thanks for your interest in the Kilyn’s Kitchen Brand Ambassador Program! We’re excited to share our yummy food with families throughout our home state of Colorado, starting with you. Kilyn’s Kitchen Family Meals are unique because we’re making fresh, all-natural, preservative-free, antibiotic-free, hormone-free dinners to feed a family of four. Our meals cost less than $15 and take less than 30 minutes to prep from fridge to table. We’ve created 3-pound meals that hit Safeway stores throughout Colorado mid-June, including Pulled Pork in BBQ Sauce with Seasoned Carrots and Potatoes, Beef Goulash, Chicken Fajitas with Spanish Rice, and Pulled Chicken in BBQ Sauce with Roasted Corn and Potatoes. Please visit our Facebook page to see photos of the packaging and plated meals and to keep up with the latest news. · On-Site Marketing: Represent Kilyn’s Kitchen by highlighting products, distributing coupons and informing potential customers about the products’ key differentiators from the products’ location within the meat department at Safeway. · Content Contributions: Share heartfelt, funny or helpful stories to benefit other moms. We’ll share the content with our social media community. We’d also love stories about how our products help make your life easier. · Product Reviews and Customer Feedback: Provide feedback on your experiences with our products and interactions, such as frequently asked questions, hesitations and appealing factors of our products based on your interactions with customers during on-site marketing. Still interested in joining our team? Great! Email info@kilynskitchen.com for the next step toward your exciting career in the food industry!